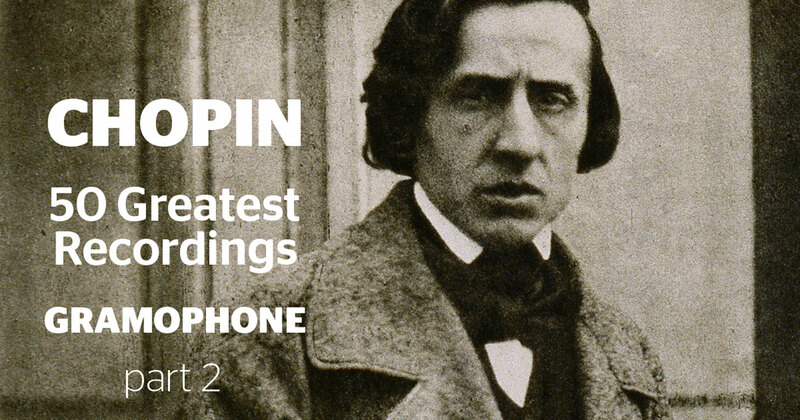 In the Chopin sonatas it’s difficult to think of which performance to choose as the greatest. Aside from the Funeral March itself, Rubinstein’s account of the Second Sonata is a bit too imperious; the Third is much more thrilling, with considerable technical risks being taken both in the first movement and the finale. His own feeling for quiet nuances in the Largo of this work is quite superb, and here too Pollini on DG achieves an innocence that’s disarming. Pollini’s disc is the most perfect, both in terms of the pianist’s technical accomplishment and the lucid piano sound, with nothing that offends the ear. The middle treble range in Rubinstein’s piano sound has a hollow resonance. Rubinstein tackles the F minor Fantasie in rather a heavy-handed manner, with more power than searching drama. If you want your Chopin sonatas balanced and formally cohesive, then Rubinstein is for you. This is a disc that takes you by stealth. Not simply because it opens almost unassumingly, with a finely wrought Berceuse, but because it was only after several listenings that one realises just how good it is. This is Hamelin’s second recording of the Second Sonata and it shows how much his pianism has developed during the intervening time. Hamelin’s playing is refreshingly free from the ‘inverted comma’ school of profundity, and he lets the music speak through him most eloquently; he doesn’t get carried away with the subtext of the Second’s Funeral March, keeping it flowing (with desynchronisation of the hands subtly done) and all the more effective as a result. In the slow movement of the Third he finds time to dream without ever becoming portentous, and is every bit the equal of Nelson Freire (Decca), whose Chopin sonatas have rightly won considerable praise. Predictably, Hamelin is wonderful in such things as the Scherzo of the Third and the visceral finale of the Second, though perhaps slower than you might expect in the neurotic Scherzo of No 2. In the finale of the Third he doesn’t begin the build-up too soon, as can be a temptation, and even has a skip in his step. The addition of two Nocturnes and the sublime Barcarolle simply confirm that though Hamelin has made many fabulous discs, particularly in repertoire of superhuman virtuosity, this is one of his very finest achievements to date. Lesser mortals may well weep with envy at such unfaltering authority and one hesitates even to imagine the hours of work behind such magnificence. What a glittering and assured curtain-raiser to the Op 10 Etudes; and if she can command with the best of them she can just as easily take you into her confidence. No 3 is, for once, truly Lento though with a marked sense of character in the central Poco più animato, while in No 6 Fialkowska is hauntingly responsive to Chopin’s nameless malaise. How perfectly she judges the echoing mountain-calls in No 9, while even the most seasoned pianist might despair over her fleetness in the Op 25 Etude ‘in thirds’. Elsewhere she is grand and imperious in the Second Sonata, storming the first movement’s climax in towering and heroic fashion, and her demonic pace and drive make a true Mephisto-scherzo of the second movement. Her finale, while hardly sotto voce, opts for a more ferocious but intriguingly voiced alternative and she has all of the four Impromptus’ lighter charm and caprice at her fingertips. Her B minor Sonata is as thoughtful as it is masterly and if one occasionally misses the seductive tonal allure and magical cantabile of a Cortot or Perahia (most notably in the Largo), there’s admiration aplenty for such clarity, strength of purpose and musical integrity. Fialkowska offers an unfailing balance of sense and sensibility. Well recorded, she has done her one-time mentor, Arthur Rubinstein, proud. It’s a credo that serves Chopin’s genius far better than the default approach (it complements each Nocturne just as much as it does the Scherzos), the more so when the performances are as richly coloured and deftly articulated as these. Along the way there are some lovely individual touches like the way Lortie varies the dynamics in the exposition repeat of the First Scherzo, and the way he tiptoes querulously into the minor-key episode of the Third Scherzo. The soundscape of the recording is bit man-alone-in-empty-studio, and a da capo (rather than doppio movimento) repeat in the Sonata’s first movement always sounds clumsy. But these are minor cavils. This is Chopin-playing of a superior order. Argerich’s pianism is remarkable for combining seemingly effortless technical resource with temperamental volatility. Yet the vehemence of her playing is seldom to the disadvantage of the extraordinary subtlety of her art. Moreover, despite the limits she places on her repertory, such is the spontaneity of her approach that each of her interpretations, no matter how familiar in broad outline, is characterised by a profusion of contrasting details beneath the surface. In the B minor Sonata she omits the first-movement repeats. Such a formal contraction can contribute to the momentum with which the movement unfolds. Ironically, however, she seems to rein in the propulsive power for which she’s renowned, appearing instead to be seeking at every turn to exploit a deeply felt exprssive lyricism to offset the febrile intensity of the most energetic figurational devices. This has the virtue of allowing us a less hectic view of subsidiary elements within the music, which elsewhere can too often be overwhelmed by the sheer turbulence of the action. Some of the most satisfying playing on the disc comes in her account of the Op 59 Mazurkas. There’s a vulnerability as well as an affecting wistfulness about the playing which captures the elusiveness of the idiom, with its harmonic ambiguities, with rare acuity. At the other end of the scale, the excitement she generates in the A flat Polonaise is of an order that goes far beyond mere effect. If these accounts do not necessarily outstrip her other recordings, they nevertheless offer an intriguing insight into a ‘work in progress’ from a pianistic giant whose artistry continues to fascinate and perplex. Argerich first came to international prominence in 1965 when she won the Chopin Competition. The first track on this CD dates from six years earlier, a blistering performance of the G minor Ballade recently unearthed in the archives of Deutschlandradio Kultur (formerly RIAS) in Berlin. The work is new to Argerich’s discography but, though it will not worry her legions of admirers, neither the recorded sound nor the duff piano are things of aural beauty. There is a marked improvement in these respects in the following selections of Mazurkas and Nocturnes recorded in a different RIAS studio eight years later with, inevitably, a greater depth and maturity to the playing. Before these, there is a quite dazzling performance of the Op 10 C sharp minor Etude, not the fastest on disc (though fairly brisk) but one of the fastest that also makes musical sense. This and the Mazurkas Op 24 No 2, Op 33 No 2 and Op 41 Nos 1 and 4 are also works Argerich has not otherwise recorded. From the playing here, it’s no wonder she won the Chopin Competition. Likewise in the three Mazurkas Op 59, discovered in the vaults of West German Radio (WDR) in Cologne, she captures their intimacy and lightning changes of mood to perfection. Then the B minor Sonata, a live performance at the Berlin Hochschule für Musik. Though she over-reaches herself in the first part of the Scherzo, this is even better than her familiar studio recording of two months earlier. In the finale (for once truly agitato) she sweeps all before her with breathless exhilaration. Kissin is among the master-pianists of our time. What magnificence and assertion he finds in the B minor Sonata’s opening, what menace in the following uprush of chromatic scales, his deliberate pedal haze -capturing one of Chopin’s most truly modernist moments. He may relish left-hand counter-melody in the return of the second subject and elsewhere, yet such detail is offered within the context of the whole. A momentary failure of concentration in the Scherzo comes as reassuring evidence of human fallibility but elsewhere one can only marvel at a manner so trenchant, musicianly and resolutely unsentimental. The equestrian finale is among the most lucid on record and concludes in a controlled triumph that has the audience cheering to the heavens. The 12 Mazurkas are no less remarkable for their strength and discretion. Everything unfolds with complete naturalness and authority. The beautifully idiomatic rubato is so stylishly applied that you’re only aware of the finest fluctuations of pulse and emotion. Few pianists have gone to the heart of the matter with such assurance (always excepting Arthur Rubinstein). The recording captures Kissin’s clear, unnarcissistic sonority admirably and audience noise is minimal. This is surely among the greatest of Perahia’s many exemplary recordings. Once again his performances are graced with rare and classic attributes and now, to supreme clarity, tonal elegance and musical perspective, he adds an even stronger poetic profile, a surer sense of the inflammatory rhetoric underpinning Chopin’s surface equilibrium. In other words the vividness and immediacy are as remarkable as the finesse. And here, arguably, is the oblique but telling influence of Horowitz whom Perahia befriended during the last months of the old wizard’s life. Listen to the First Ballade’s second subject and you’ll hear rubato like the most subtle pulsing or musical breathing. Try the opening of the Third and you’ll note an ideal poise and lucidity, something rarely achieved in these outwardly insouciant pages. From Perahia the waltzesare marvels of liquid brilliance and urbanity. Even Lipatti hardly achieved such an enchanting lilt or buoyancy, such a beguiling sense of light and shade. In the mazurkas, too, Perahia’s tiptoe delicacy and tonal iridescence (particularly in Op 7 No 3 in F minor) make the music dance and spin as if caught in some magical hallucinatory haze. Finally, two contrasting Etudes, and whether in ardent lyricism (Op 10 No 3) or shot-from-guns virtuosity (Op 10 No 4), Perahia’s playing is sheer perfection. The recording beautifully captures his instantly recognisable, glistening sound world. This is astonishing piano playing; Chopin interpretation that, at its best, fully measures up to the greatness of these pieces. Stephen Hough’s accounts offer plenty of refreshment to spirit and senses. The distribution is interesting, chronological but alternating one of each, which may not make a recital to consume at one go but helps to point up these pieces’ diversity and individual character, as well as Chopin’s mastery of large forms. Hough is unfailingly thoughtful; there isn’t a note that hasn’t been cared for. Just a few of them (Third Ballade, for example) are picked out of the texture and strung together for our delectation in a way that might strike you as otiose if you’re in a sober-sides kind of mood. The surfaces of his presentations are very ‘worked’, more indicative of application, maybe, than of organic growth. But this isn’t superficial playing – the performances catch fire. He inclines to the accepted view that Chopin’s large forms have a ‘plot’ that culminates in a tumult or a whirlwind of activity. The tempest in the coda of the Fourth Ballade might have been a mite less furious, to let the ear have more time to register what’s going on. The closing pages of No 1, on the other hand, have an exemplary finish and allure. Most distinguished of the Ballades is No 2, where Hough perceives the invasion of one kind of music by another in all its subtlety and lays out a spellbinding seven-minute drama. He has interesting points to make in the Scherzos, too. Where many a player is content to let recurring sections and paragraphs register simply as the music we heard before, with him they sound different in some degree, affected by what’s come in between. Hough is always doing something, though sometimes you might wish he were doing less. This is an issue out of the ordinary; welcome, too, for being handsomely recorded and produced. Following his celebrated earlier discs of Beethoven, Mozart and Bach, 34-year-old Piotr Anderszewski gives us an exceptionally powerful and seductive Chopin recital. He prefers a subtly chosen programme to complete sets of the Mazurkas, Ballades or Polonaises, and his often phenomenally acute and sensitive awareness of Chopin’s constantly shifting perspective has you reliving every bar of such incomparable music. In the three Op 59 Mazurkas (a notably rich part of Chopin’s deeply confessional diary) he achieves a rare sense of brooding introspection, close to neurosis, with bittersweet mood-swings that shift from resignation to flashes of anger. Then there’s the F minor Mazurka, Op 63 No 2, taken for once at a true lento, a dark place indeed for Anderszewski, with only relative light in the central idea to lessen the mood of heart-stopping despondency. Again, in both the Ballades his sharply original ideas combine with a total responsibility to the score; seldom can the letter and spirit of the composer be united so flawlessly. Eyebrows may be raised in the A flat Polonaise but this is no obvious celebration of triumph over adversity, rather a re-creation of music which lives again in all its initial audacity. Here, in this great young pianist’s incomparable hands, and in Erato’s excellent sound, is living proof that Chopin’s music is forever new, forever revelatory.